Ground floor double room, can have connecting door to Room 9a as a suite of two rooms. Minimum two-night stays at weekends. 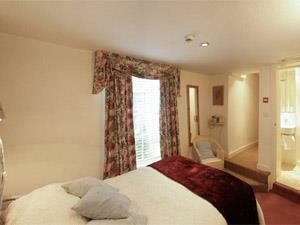 Single occupancy available from Sunday to Wednesday. Rates include a buffet breakfast and VAT. Well-behaved dogs are welcome @ £15 per night. A limited number of secure parking spaces @ £25 per day per car. Larger vehicles and vans will be directed to private off-street parking about seven minutes walk away. Bookings made online will attract an administration charge of 2%.